The “Underground Alba” project was launched in Spring of 2011. It is administrated by “Ambiente & Cultura” and co-ordinated by the Museum “F. Eusebio” of Alba, with the patronage of the Ministry of Culture and of the Archaeological Superintendence of Piedmont and MAE. The 2013 profits have been destined to the restore of the Mastodon of Verduno, a fossil partially destroyed by an illegal excavation, and to the safeguard of Tanaro river paleontologic heritage. TO DOWLOAD THE FLYER WITH ALL INFORMATION, PLEASE CLICK HERE. Scheduled dates. In the scheduled dates the visits are led in Italian language and a written translation in English is available for foreign visitors. For other dates contact us. 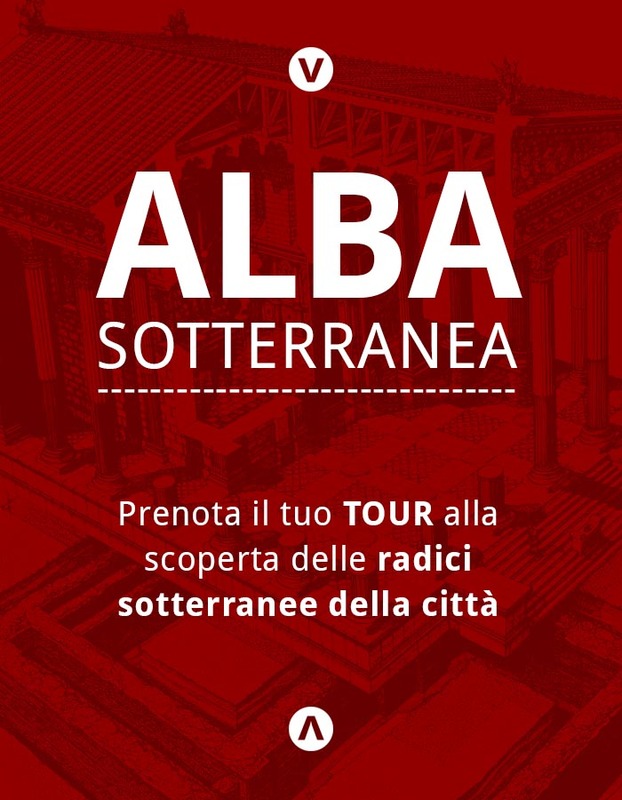 The tour begins from in front of the Tourist Office in Piazza Risorgimento n.2, Alba. Participants are asked to gather at the meeting point for registration 15 minutes before to the starting time. Booking is mandatory in advance and must be done in written form. For individuals and families click here and choose the date from the list. For groups fill in the form in the bottom of this page or write a e-mail to info@ambientecultura.it. Please note that the itinerary will vary according to the day selected (click here to know the itineraries). The journey foresees to reach 3 of the 32 the archaeological and monumental sites of the city and it ends in the “F. Eusebio” Museum. To the participants will be given a free archeo-map of the city and a free pass to the Eusebio Museum. Reduced-price ticket (0,50€) to the San Giuseppe bell tower where participants can enjoy the panoramic overview. It is also possible to purchase some publications at a lower price in the museum. It is strongly advised to use appropriate footwear. The organizers are not responsible for accidents or loss or damage to private property during the excursion. Booked tours will take place under any weather conditions.